The Endangered Wildlife Trust’s Drylands Conservation Programme (EWT-DCP) recently embarked on a five-year project in partnership with the United National Development Programme (UNDP) and the Department of Environmental Affairs (DEA) to promote sustainable land management in the Nama Karoo. The project is funded by the Global Environmental Facility (GEF). The project, entitled ‘Securing multiple ecosystems benefits through sustainable land management in the productive but degraded landscapes of South Africa’, also known as the Sustainable Land Management Project, will be rolled out in three different geographic regions by three partners. The EWT will implement the project in the Northern Cape’s Nama Karoo; Rhodes University is working in the Baviaanskloof in the Eastern Cape Province; and the Council for Scientific and Industrial Research (CSIR) is working in the Olifants River Catchment in Mpumalanga Province. Responsible natural resource management ensures the integrity of ecosystems and the continued provision of ecosystem services to current and future generations. Implementing sustainable management in the Nama Karoo has the potential to not only improve agricultural production and the conservation of biodiversity, but also sustain livelihoods in this arid ecosystem. The project aims to identify the drivers and barriers to sustainable land management. This will include an in-depth assessment of the causes of land degradation and the best available approaches to restore degraded land. A strategy will be developed to promote and implement climate-smart ecosystem management and rehabilitation measures at farm, municipal, provincial and national levels. Conducting the project in three different areas also creates the opportunity to develop and explore divergent approaches that are suitable for different settings. The DCP will engage with stakeholders at various levels throughout the project focussing on commercial and emerging farmers. Of interest is the generational knowledge held by farmers in the Nama Karoo. This aspect will be researched through surveys and habitat assessments with a view to identifying a range of best practice guidelines for rangeland management and restoration practices. This information will ultimately be made available, at all levels, to stakeholders and decision-makers through workshops and project materials. 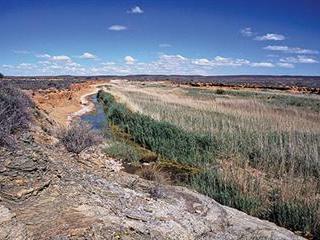 Ultimately, the project will aim to achieve the following outcomes: a reduction of land degradation and improvement of ecosystem services in the Karoo, increased technical capacity and management of land degradation risks, and the development of financial and governance frameworks to support the adoption of sustainable land management approaches.